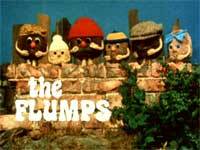 The Flumps was one of the regular programmes that was shown on the BBC’s See-Saw slot for tots, shown around 1pm in the afternoon on weekdays, if my memory serves me correctly. It was perfect gentle viewing for pre-schoolers, and centred around a family of Flumps, strange hairy ball creatures consisting of little more than a face, and a pair of arms and legs. Whilst their arms and hands could move, the relaxed position for them was to have them holding the front of their body, almost as if they had just finished eating a massive meal. The first time I heard of Culture Club was one evening when they appeared on Top of the Pops. Said show was on TV, and Culture Club were playing their first big hit “Do you really want to hurt me?“. My Dad walked in and, never being one to mince his words, said, “That’s a bloke singing!“, referring of course to Boy George. Of course, being still of primary school age both my sister and I refused to believe him, since the person on TV was clearly a woman in our eyes, what with the heavy make-up and wearing what appeared to be a white dress. Do you remember Opal Fruits? OK, I know you can still get Opal Fruits today (I refuse to call them Starburst – this is an 80’s site you see!) but the reason I ask this question is if you remember them being called Opal Fruits you may also recall the subject of this post – Pacers mints. Pacers were the same size, shape and consistency as an Opal Fruit, and sold in similar sized packages, but instead of being fruity flavours they were mints. They were Spearmint flavoured and very tasty too! Since they were chewy they were far too easy to eat quickly, meaning they never lasted quite as long as your average Polo mint. They also suffered from the problem of getting stuck on your back teeth. This was not usually stuck in the toffee pulling your fillings out sense, but you would get a little blob of Pacer stuck to one of your back teeth, which then required some determined tongue olympics to flick it back off. This is just a quick post to tell you about the latest addition to our site, the BlogRush “From The Blogosphere” widget that is now gracing our sidebar.Â This useful little widget shows random post titles from other blogs on the web who also have the widget on them, and in return, our post titles get randomlyÂ displayed on their web pages.Â From our point of view this means we hopefully will get more visitors to our pages, and with luck it will give you, the reader, something else interesting to read about. If you have a blog yourself, and you think it sounds interesting, then you can either sign up to the service at the BlogRush web site, or alternatively you can click on the bottom section of the widget in our sidebar to do the same thing.Â It’s completely free, so what have you got to lose?Â Oh, and if you click on one of the links from our web site, you’ll be giving us a helping hand asÂ BlogRush rewards referring sites by giving them bonus chances of having their post titles displayed on other blogs! Diffâ€™rent strokes was one of those â€˜niceâ€™ programmes of the 1980â€™s that absolutely everyone remembers. 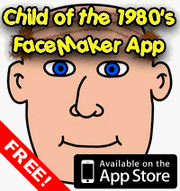 It ran from 1978 to 1986, with a total of 189 episodes. One of the main aims of the programme was to explore racial and social issues, which was a first for a sit-com of this era. 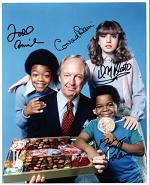 Diff’rent Strokes took place in New York and centred around the day-to-day life in the Drummond household. Philip Drummond (President of the massive conglomerate Trans-Allied Inc) was a widower and had a 13 year old natural daughter, Kimberly. However, the household was shaken up when Drummond’s black housekeeper died and her deathbed wish was that he would take care of her two sons, Arnold and Willis Jackson. As a man of his word. Drummond willingly took both of them in when she died, but there were more than a few double-takes as Mr D introduced the two black boys as his â€˜sonsâ€™. Paddington Bear was the brainchild of Michael Bond, who created the little brown bear from darkest Peru way back in the late 1950’s. The idea for the character came from a toy teddy bear that Michael Bond had bought for his wife on Christmas Eve 1956, because he saw it sat all alone on the shop shelf and felt sorry for it. Since they lived closed to Paddington railway station in London, he named the bear Paddington. Paddington first appeared to the public in 1958 with the book “A Bear called Paddington”, with the Brown family finding him sat alone at Paddington station with a label saying “Please look after this bear“. 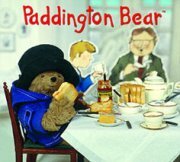 However, this post is primarily concerned with the TV series made during the late 1970’s and early 1980’s, which is how I best remember Paddington. The show had a unique look, with Paddington being a stop motion animated puppet, dressed in a blue duffel coat with a massive black hat perched on his head. All the background sets were very plain though, being two dimensional white cardboard cutouts, which meant that Paddington was always clearly visible. The human characters were also just two dimensional animated cutouts, though they were eventually allowed a splash of colour as well. 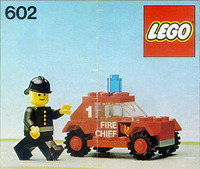 I say eventually, as I’m sure they were originally black and white like the backgrounds, but this may be my memory failing me, as I’ve not been able to find any evidence of this! In the days before DVD and hard disc based Personal Video Recorders we all used videotapes to watch and record our favourite TV programmes and films. To be fair, most people still record off the telly using videotapes to this day, but with the cheapness of DVD players these days, I don’t suppose many pre-recorded videotapes are bought any more. Back in the early 1980’s was when video recorders first started to become within reach of the man in the street, but you were also forced with a choice of which videotape format to plump for. 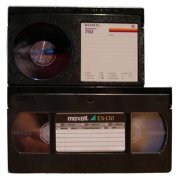 There were three main home videotape formats to choose from, these being VHS, Betamax and V2000. As we all now know, VHS was the eventual winner of the videotape format wars, and God bless my Dad for making this his choice when he first invested a hefty slab of money on our family’s first video recorder.